If you are looking for a group exercise class that is inviting and allows all participants to work at their own pace, then we are the fitness instructors for you. 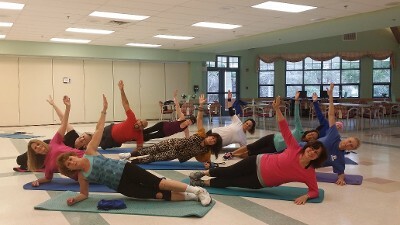 Register for one of our classes to benefit from improved mobility and cardiovascular fitness. You will also improve your balance, increase core strength, and tone and strengthen various muscle groups. Headquartered in Davidsonville, Maryland, BioFitness offers group exercise classes in Anne Arundel, Calvert, and Prince George's Counties. The owner of our business is an experienced fitness instructor who supervised, choreographed and taught safe, effective routines for many years before establishing BioFitness in 2012. All our BioFitness instructors are industry certified, very experienced, and will welcome you into the class that you choose in a very friendly manner. We offer several unique programs to suit your fitness needs, including BioFitness Aerobics (High/Low), BioFitness Aerobics (Low Impact), BioFitness Tone & Firm, and BioFitness Senior Aerobics. Browse our wide selection of class schedules to find a class that is located conveniently near you. Join the class and experience a fun, friendly way to improve your fitness through our group exercises!